The Fort Myers Miracle is a minor league ball club based in Fort Myers, Florida. 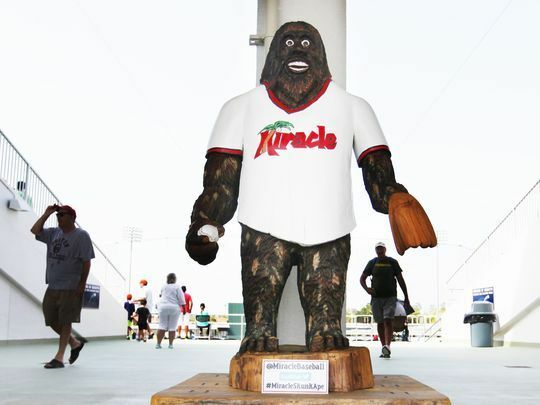 In a shining example of the importance of the skunk ape to Floridian culture, the baseball team adopted a statue of the cryptid as a kind of mascot. They place the statue in a different area of their stadium each game, and then encourage fans to find the elusive skunk ape and take pictures with it to share on social media. The skunk ape has wide regional popularity, very similar to that of Bigfoot in the Pacific northwest, and it’s not unusual to see it displayed in a variety of venues--the power behind stories of the creature evident in its broad marketability. Why Not Look the Part with Merch from our Singular Shop?